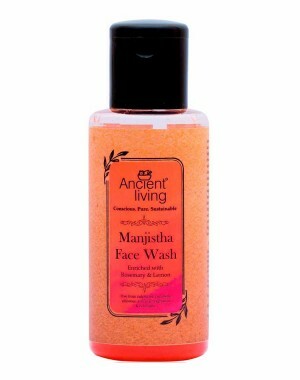 It is a mild and purifying face wash intended for everyday. It has soothing properties and an excellent blood purifier. Manjistha has been recognised by Ayurveda as anti-inflammatory. Ancient Living Manjistha Face wash is a mild and purifying face wash intended for everyday use all round the year. Manjistha has been recognised by Ayurveda as anti-inflammatory with soothing properties and an excellent blood purifier. Helps heal damaged skin tissue while clearing dark spots. It's mild and gentle lather washes off excess oil and grime leaving the skin soft and silky. Natural almonds are a great source of Vitamin E which helps fight free radicals and prevents oxidative damage ensuring a smooth and moist skin. Precious almond oil nourishes and conditions the seven dhatus of the skin. Glycerine, natural humectants moisturises and softens. Natural Vitamin E keeps skin youthful. Its non-drying formula ensures skin softness. It recommended for all skin types.